Samsung signs streaming deal for its smartphones and tablets with Google | What Hi-Fi? Thanks to a new deal between the two companies, if you pick up a Samsung Galaxy S8 or S8+ when they go on sale on Friday, you'll find the default music player for both is Google Play Music. Owners of either new Samsung phone will also get access to special Samsung-only features, including the ability to upload and stream up to 100,000 of your own tunes to Google Play Music free of charge. That's twice as much as regular Google Play Music customers get. Samsung's upcoming smartphones and future tablets will also come with a free three-month trial of Google Play Music. That means no adverts, and access to over 40 million songs and thousands of playlists tailored to all manner of moods and occasions. It also includes access to Google's paid-for video service YouTube Red, in regions where it's available. Google Play Music also works with Bixby, Samsung's Siri-style personal assistant that's present on the new phones. Ask it to play a song, and it'll fire up the app. Google announced the news in a blog post. 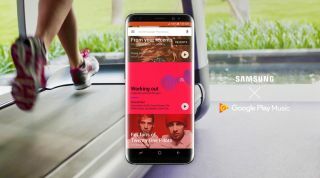 "We're thrilled to bring this special version of Google Play Music to Samsung customers everywhere, and we look forward to bringing the best music experience to your Samsung device," wrote Elias Roman, lead product manager at Google Play Music. "Together, we're committed to delivering the perfect soundtrack to make your everyday moments better." Don't worry if you're not looking to switch to Google Play Music - you'll still be able to download services like Spotify, Qobuz and Tidal to your Samsung device.